Jürgen Klopp welcomes back Liverpool "legend" Rafa Benitez to this Boxing Day clash at Anfield in his programme notes, but insists the special relationship the Spaniard has with LFC will be put on hold for 90 minutes today. Jordan Henderson meanwhile in his captain's column shares his gratitude for the staff of Alder Hey at this and all times of the year - legends in their own right - as well as reflecting on the squad spending some time with the children battling illnesses at the hospital. Elsewhere in the official matchday programme we speak to Naby Keita and Gini Wijnaldum and remember the 'other' 4-3 against Newcastle in the Nineties. 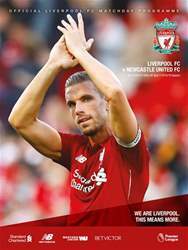 All this and more in the Liverpool v Newcastle United programme, on sale now.